Nothing is forever, except maybe plastic. And despite the well-funded, deliberate, universal misconception, it’s anything but disposable. Virtually every one of the innumerable pieces we’ve ever made is still with us, somewhere. The amount we are currently producing each year equals the total weight of humanity. It’s truly and totally ubiquitous, everywhere and in everything, including the broken-down microscopic filaments in our drinking water, sea salt and beer. It finds its way into the bellies of anything alive in the ocean, the guts of 90 percent of birds, and finally, ourselves. In line with the credo of every con-artist – “There’s a sucker” – or, make that customer – “born every minute” – plastic is one of the biggest, deadliest scams in history, especially single-use plastic. Manufactured in mere seconds, it struts its brief life in myriad ways: in an indispensable smart phone, computer, appliance or automobile. And most often, its raison d’etre is only momentary – as a package wrapper, for instance. It is the very stuff of advertiser’s dreams and a planetary nightmare, the raw material of our addiction to what we are told we want and need. It is the ultimate human invention, at once so necessary, yet unnecessary, tough, pliable, lightweight and eternal. Take the plastic water bottle (please). Despite millions of dollars spent annually to convince you otherwise, bottled water is no better or safer than most municipal tap water, which is precisely where two-thirds of it comes from in the first place. Too much of it is also mined for a pittance of what it’s sold for, by companies such as Nestle, whose CEO is on record saying water is not a human right. Siphoned from a source we have held in common, since humans first crawled out of water onto land, bottled water is the poster child of corporate and government corruption and free-market, neo-liberal snake-oil salesmen. Also of interest: the energy used to produce a plastic water bottle is equivalent to one-quarter of the volume of its contents. 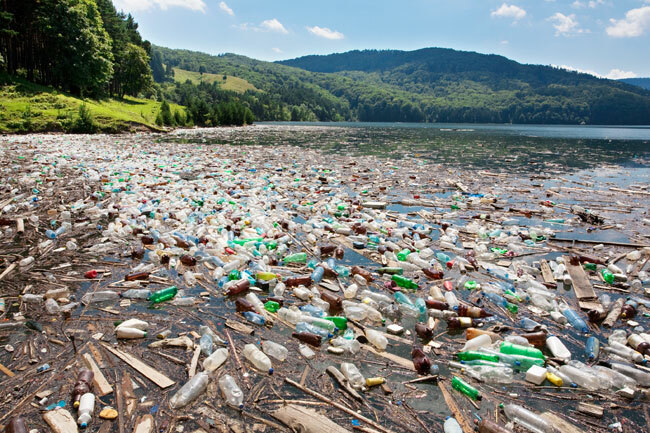 Non-profit Pacific Institute researchers also determined that the manufacture of one pound of PET – polyethylene terephthalate – plastic releases up to three pounds of carbon dioxide. So, once again, it’s down to fossil fools. No surprise then that Justin Trudeau’s Liberals recently glad-handed $35 million tax dollars to a chemical company that makes plastic resins, the day before he promised to use Canada’s G7 presidency to encourage other nations to commit to reducing or phasing out single-use plastics. You read that right. Part of our federal government’s five-year, $1.26-billion, Strategic Innovation Fund, unveiled in last year’s federal budget, is earmarked for Nova Chemicals’ $2.2-billion expansion plan in Sarnia, Ontario, to enable the production of 431,000 additional tonnes of polyethylene, annually. Keith Stewart, senior energy strategist for Greenpeace Canada, is among those who are having difficulty swallowing Canada’s commitment to reducing ocean plastics when it’s also providing multimillion-dollar grants to the companies that make them. It’s part of our Justin’s murderous mantra to build more pipelines to somehow combat climate collapse. Could be why John Horgan is so high on LNG, made possible by fracking the bejusus out of BC, while destroying obscene amounts of precious water and releasing deadly methane. Even as we have been warned, the drilling goes on, deep in every direction into the dangerous San Andreas Fault, in defiance of the ‘Big One.’ It is most certainly why, in shale-gas glutted Trump-land, plastic production is being hiked by a whopping 40 percent. Everybody sing: “Oil… what’s it good for?” For the same thing as shale gas: to make more plastic. The shillers who are leading the chorus bring to mind actor Rip Torn, straddling a nuclear bomb, riding it out of the chute of an airplane, while shouting “Yee, Haw!” in the final scene of the iconic movie, Dr. Strangelove. And some may remember the 50’s folksong, Plastic Jesus: “I don’t care if it rains or freezes/As long as I’ve got my Plastic Jesus/Ridin’ on the dashboard of my car.” Hell, even the dashboard is plastic, these days. “Are plastics an institution? Not in the sense of having a pope, or even a small cabal of leaders. But they are surely the modern equivalent of a universal religion. We worship them, whether we admit it or not. Their centre is whatever you happen to be doing, their circumference is everywhere; they’re as essential to our modern lives as the air we breathe, and they’re killing us. They must be stopped,” she wrote. Don’t be a sucker. Don’t be lulled into stupefying complacency, fooling yourself into the cognitive dissonance that you can’t do anything about the madness. Stop treating plastics as disposable. Real friends don’t let their friends drive while drinking or texting, or eat farmed salmon. And perhaps most importantly, they don’t let them drink water from a plastic bottle. In recent weeks the world has awakened to the nightmare: one study quantifies water in plastic bottles as currently more popular than soda pop, another, that more than 90% of bottled water contains deadly microplastics.